NTR biopic trailer will be out on December 21st. Makers unveiled first look of Vidya Balan as Basavatarakamma from the movie. Nandamuri Balakrishna plays NTR in the movie directed by Krish Jagarlamudi. NTR Kathanayakudu is set to release on January 9th for Sankranthi while second part NTR Mahanayakudu has been postponed to Feb 9th. Happening heroines are playing yesteryear actresses in the film. Here’s star cast poster released by the makers. 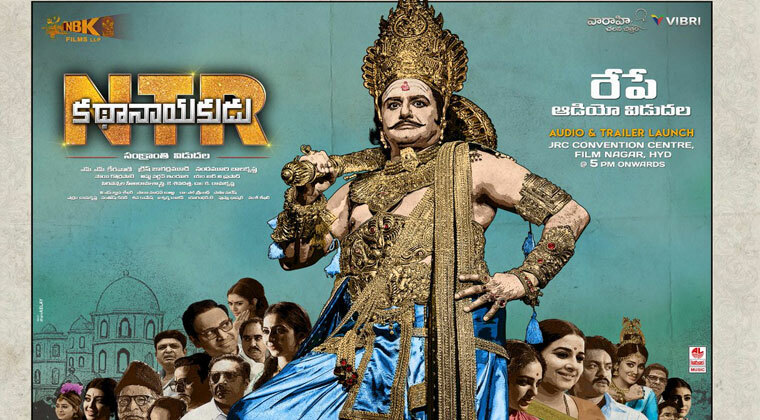 Balayya looks regal as Ravanasura, the iconic role of legendary NTR. MM Keeravani composed songs are already topping the charts. Audio jukebox will be released on Dec 21st along with the trailer. Previous articleరావ‌ణ్ గా బాల‌య్య‌.. రెండు క‌ళ్లు స‌రిపోవ‌డం లేదుగా..